New Orleans has always been a place of travel by many means: boats, horse carriages, trains, streetcars, automobiles, and yes, the bicycle. According to the American Community Survey, New Orleans has the 10th highest percentage of people who cycle to work each day and in 2016 was named No. 19 out of 50 of the best bicycling cities in America by Bicycling.com. So it’s no surprise that this city, steeped in tradition, has developed a culture of its own around biking. Marin Tockman, shop owner of Dashing Bicycles & Accessories, is enthusiastic about the development around bicycling over the years. Her mission, and that of Dashing Bicycles, is to foster and empower women and families to be part of an active and mainstream bicycle network. “I think cycling has increased amongst millennials and commuters. We have a growing social riding scene, so although many people might not commute to work by bike, they are taking to biking because of more social riding opportunities, or ways to get to social events like our festivals or parades,” she said. There are plenty of ways to celebrate and get social in this city while getting your roll on. 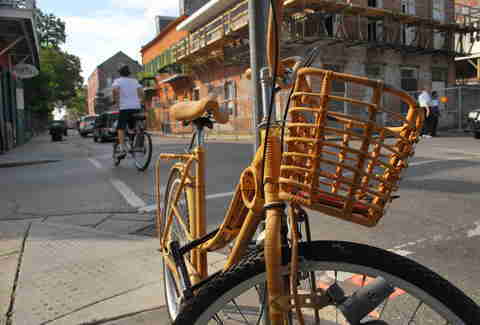 Social rides like Get Up and Ride NOLA offer an opportunity to cruise with other bike enthusiasts and commune in a way only New Orleanians can. The weekly night ride movement was co-founded by Blake Owens and Nick Reed with help by local celebrity DJ Poppa, in 2010 and encourages LED infused bicycles. Bike clubs are nothing new for the city. Founded in 1881, the New Orleans Bicycle Club formed with the athlete in mind, but nowadays you’ll find riders of all kinds. With the expansion of bike lanes, cycling groups and organizations, and social rides every night of the week, The Crescent City has rapidly expanded to become one of the best bike cities in the country. Since 2010, The University of New Orleans Transportation Institute and the Regional Planning Commission studied bicycling and pedestrian data and found an 88% increase in cycling through December 2015. 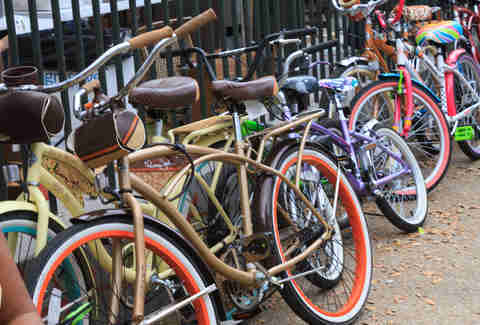 Besides taking in the historical scenery the city has to offer, cycling in around New Orleans’ green spaces is also a healthy and fun way to stay fit. April Dupre, founder and wellness coach of Footprints to Fitness, regularly bikes to City Park and along the Greenway. People may call New Orleans The Big Easy, but some of the road conditions say otherwise. 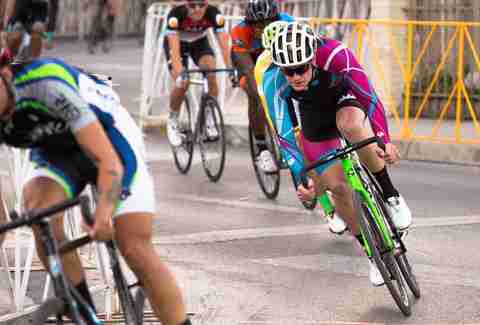 Besides the unsteady rides and occasional pothole, cyclists and drivers alike have expressed concerns over the lack of safety precautions on the roadways. “Shared responsibility and mindfulness” would go a long way in improving safety for everyone, McWhorter noted. “Bikers don't use proper equipment, they're not putting lights on their bikes, they're not wearing helmets and a lot don't know proper lane usage, hand signals, and general safety. I bike around the city myself and it blows me away the number of people I notice now more than ever that don't have the right equipment,” said local rider Chelsea Thomas. Another complaint from many are gaps in the network of bike lanes, which can make it difficult to transition from one neighborhood to the next. But it’s not all bumpy roads for riders in New Orleans. Conditions have been improving over the years and the city had a big win in 2015 when New Orleans opened the $9.1 million Lafitte Greenway, a 2.6-mile bicycle and pedestrian trail connecting the French Quarter with City Park -- surpassing 100 total miles of bikeways this year. With the additional funding from the National Recreation and Park Association for 2017, the Greenway will see even more developments, greatly expanding the already vibrant public space for pedestrians and bikers alike. In addition to this work, the Pedestrian and Bicyclist Safety Advisory Committee recently concluded its citywide study and presented their recommendations to city council. Tockman, who is a member of the advisory committee, has been an early advocate for change. In addition to city council’s work, many organizations have created change on their own. 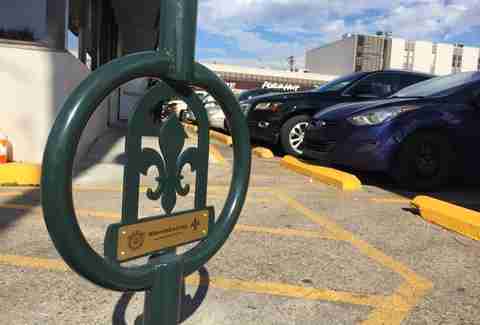 The Young Leadership Council’s Where Ya’ Rack program provides unique and secure bicycle parking racks throughout New Orleans to encourage cycling for commuting, short trips, and errands. Likewise, the Youth Empowerment Project Trafigura Work & Learn Center provides skill-based learning opportunities, such as bike repair, to help NOLA youth get and keep jobs in the city. Overall the landscape of bicycling in New Orleans is changing for the better, taking the steps (and pedals) toward transforming into one of the most bike-friendly cities in the country. 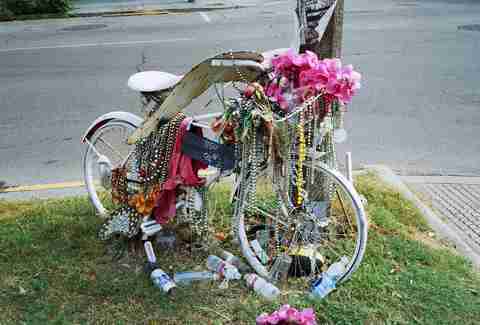 So whether it’s biking to work, for your health, or to one of NOLA’s many parades, be safe and bike responsibly. Liz Beeson is a freelance writer and work-in-progress photographer. Follow her adventures on instagram at @lizbson.